Sulfur hexafluoride (SF6) is a colorless in-noxious and non-flammable gas at atmospheric temperature.. It is chemical stable with good insulation. 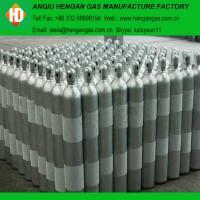 Packing: 10kg, 40kg or 50kg packed in the qualified gas cylinder or packed according to the demands. Storage and Transportation: Use, store and transport below 45C. Store in cool and well-ventilated areas. Keep away from fire, heat, sunlight and flammable substances. Handle carefully when loading and unloading to avoid damages to gas cylinders and accessories. 6) All kinds of accessories for gas equipments and piping projects. We have all ranges of gas products and we promise our gas quality can be stable and reliable.We have complete cylinder processing system to heat and vacuum the new cylinders to make sure there is no mositure and air before gas filling, and we have the chromatographic analyser equipments to test every bottle to ensure the gas purity can meet the specific requirement of clients. Our products are successfully selling to more than 30 countries or regions in the world where we gained wide compliment and good repulation. Such as Germany, France, Sweden, the Nertherlands, Spain, Russia, Australia, Bulgeria, Fiji, New Zealand, Sevilla, Columbia, Jamaica, Peru, Chile, Ecuador, Bolivia, Singapore, Indonesia, Vietname, Philippine, South Africa, Nigeria, Ghana, Burkina Faso, Angola, Congo, etc. Reply your enquiry in 24 hours working time. Customized cylinder color, cap type, valve model no. and stamping are accepted. Every cylinder will be tested before the delivery. On time delivery and satisfied sales service. Best quality, lowest price, welcome to your inquiry.